A child looks up to their father because he can be a guiding light and an inspiration to his son or daughter. 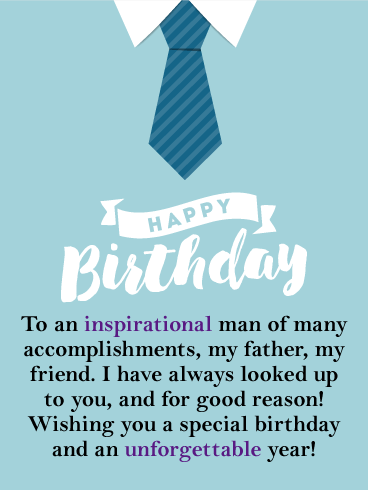 This happy birthday card perfectly sums up just how inspiring your father has been and lets him know you feel he is not only a father, but also a friend. These are words every dad would cherish! It features the typical successful father tie, something he can relate to. 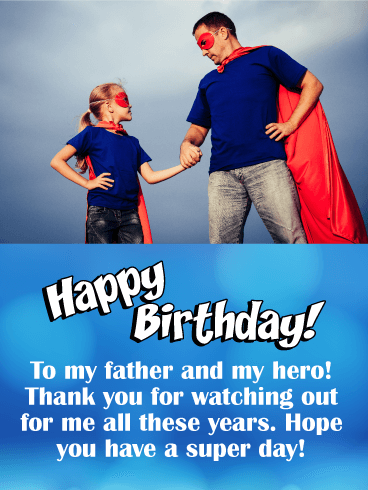 Your dad will really appreciate this wonderful birthday card! HAPPY Birthday - To an inspirational man of many accomplishments, my father, my friend. I have always looked up to you, and for good reason! Wishing you a special birthday and an unforgettable year! There are so many great things about a birthday, and sometimes presents can be the best part for a father! 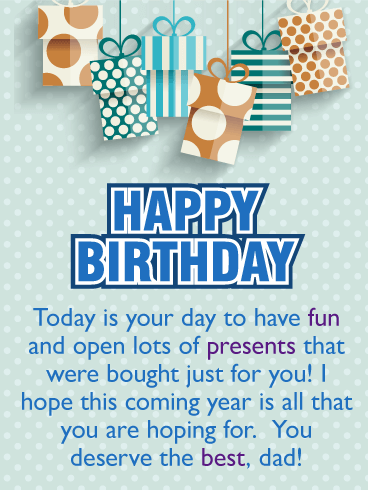 That's why this birthday card features birthday presents creatively hanging with the words Happy Birthday below them. After all, who would not be happy with presents displayed before them! 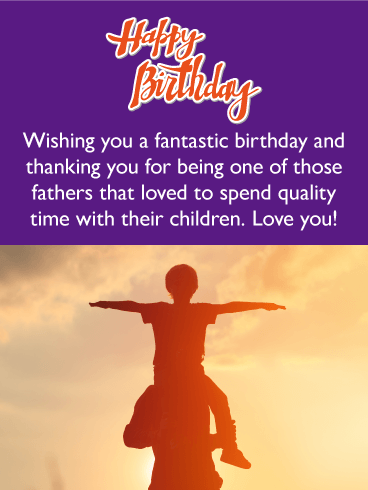 Today is your dad's birthday, so let him know he deserves the best and that you care about him by sending this fun and thoughtful birthday card his way! 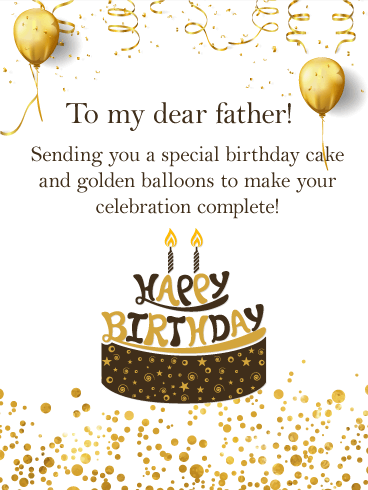 Bring out the cake, party hat, and balloons, it's time to celebrate your father's birthday! Your dad has been waiting all year for this day to arrive and it's finally here! 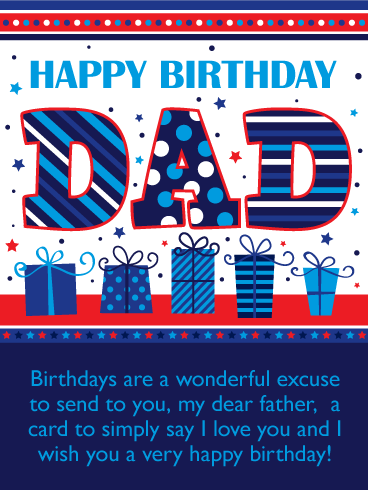 This happy birthday greeting card includes everything your dad would need to get excited about his special day. 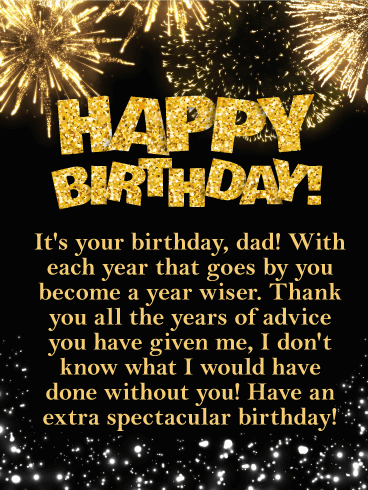 Also, telling your father how much you love him with this birthday card is the best birthday present you can give him! A dog wearing sunglass and having fun with confetti, it doesn't get any better than this! 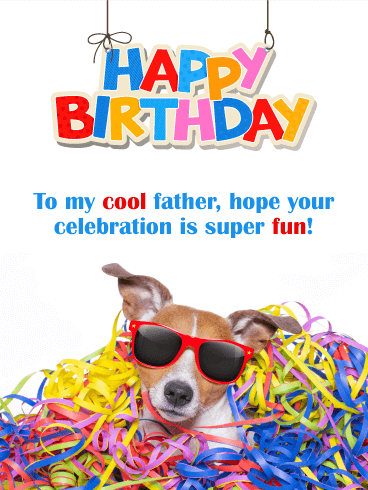 If your father is cool, then he will get a kick out of this happy birthday card. Everyone wants to have fun on their birthday, and this little guy can't wait to meet your father to get in on the fun celebration. 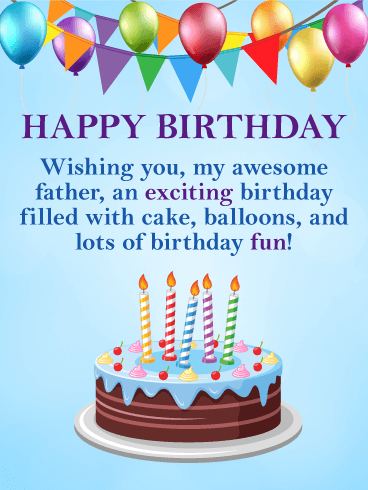 So send this colorful birthday greeting card over to your dad to get his day off to a great start! A happy dog with festive birthday balloons, so adorable! 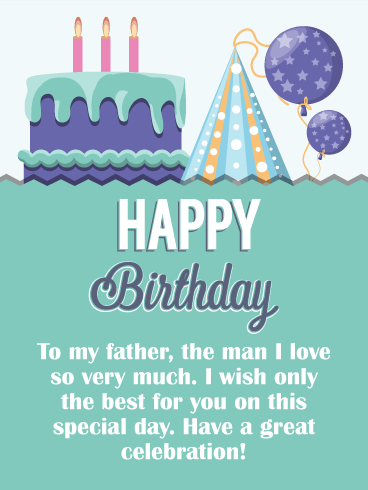 Your father will absolutely love this birthday card! It will make him smile as well as show him you think your dad is wonderful. 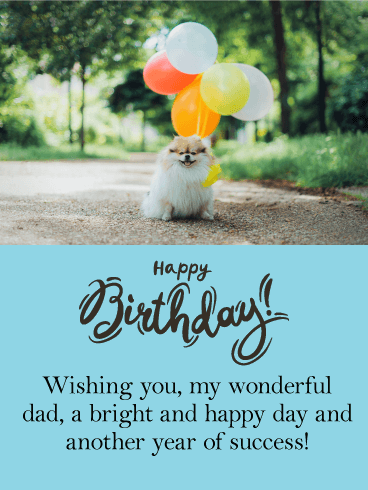 So send this little dog to see your father on his special day to wish him a happy birthday and another year of success! He will be touched that his son or daughter took the time to send him such a great birthday card.